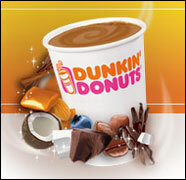 Dunkin' Donuts Coffee Getting Even Better! Think Snickers, Kit Kats and Twix bars are the best selling candies out there? Think again, chocolate-lovers. Turns out sugar free candies, as a whole, outsell each of these candy bars. While that may seem like an unfair comparison (of course a whole category will outsell a single candy bar. DOY! ), think about this. 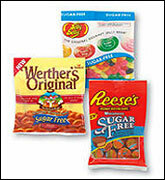 U.S. sales of sugar free or "diet" candy has practically quadrupled since 2004. Experts say the reason for this is simple. Sugar substitutes are now better, so candy tastes have improved (no more icky, chalky SF candy!). Also, parents are looking for healthier alternatives for kids these days. Russell Stover is the leader in this growing-at-lightening-speed candy category, but both Nestle and Hershey have added SF options to their product lines as well. Healthy Choice Soup in Microwaveable Bowls - Take lunch to work? Now you've got a few more soup options, thanks to Healthy Choice. Their Old Fashioned Chicken Noodle, Country Vegetable, and Chicken With Rice soups are now available in containers you pop right in the microwave. Woohoo! Propel Calcium - The popular flavored fitness water will now offer calcium-enhanced versions of three of their flavors. You'll be able to get 30% of the recommended daily allowance of calcium in every full 700 ml bottle. Available in Mango, Mandarin Orange, and Mixed Berry. Mimi's Cafe Adds Healthy Options - Mimi's Cafe is now offering a Lifestyle Menu featuring better-for-you items like their Mediterranean Omelette, Market Fresh Fish, and burgers wrapped in lettuce. Keep an eye out for a HG Chew & Tell Review soon! Yoga-lovers, listen up. Yogaconnect.com, the first (and as far as we know ONLY) community where yoga enthusiasts can "meet, discover, relate and date" is now up and running. It's brand new and free to join... the buzz is good on this one, people! ***A new study conducted by a professor at Cornell University shows that people will generally eat more when served more. That's scary when you consider the huge portions most restaurants are serving these days. ***The verdict is in! McDonald's will officially start putting nutritional info on their food wrappers. Think sales of the Double Quarter Pounder with Cheese will go down when people see that it has 730 calories and 40 grams of fat? Eeeeks! That's all we've got. HG out! Today is Halloween. Be safe. And do your best to steer clear of the candy bowl. Share this news with everyone under the sun. Click "send to a friend" NOW! Remember, if you get your friends to sign up for HG's free dail emails this week, you can win Boca Chili! YAY!